What’s on your wish list this year? 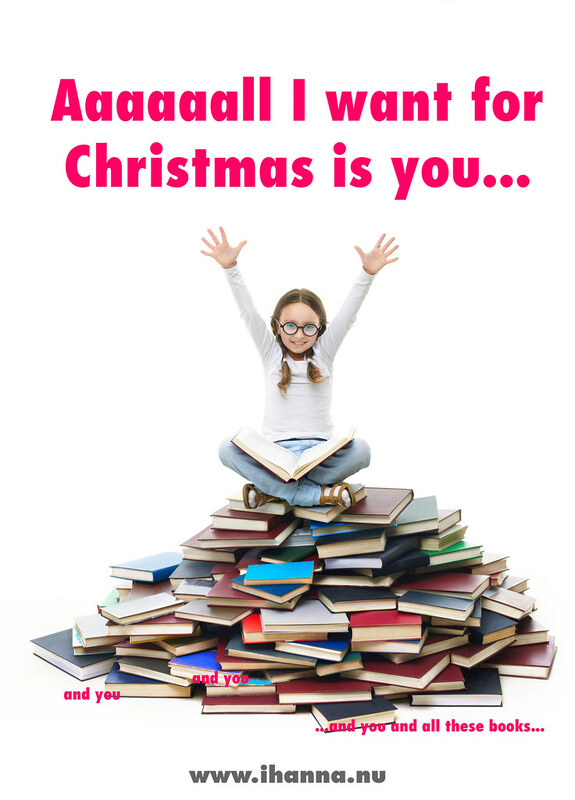 Right now I wouldn’t mind getting a pile of yummy books, in fact I have a long list of books I’m asking Santa for. Or anyone kind and generous enough to send me books. I feel like I could need some inspiration right now, I think it’s because of feeling so tired lately. I need a happiness boost, and books always does that for me. How about you? I thought I’d share just a few of the titles that’s on my want-to-read-book-wish-list today, so let’s get started. “This playful collection of rainbows is a bright and beautiful appreciation of all the color that surrounds us. Artist Julie Seabrook Ream invites us to see the extraordinary beauty of ordinary objects: she gathers colorful iterations of a single type of thing, from feathers to fishing gear, matchbooks to macarons, and neatly arranges them in rainbow order. A fascinating index details all the objects in each rainbow, bringing the magnetic appeal of meticulous organization to this burst of color in book form. A striking package with a rainbow-colored spine makes this celebratory book a treasure for those who love art, design, and a fresh perspective. I can also recommend Lisa Congdon’s book for wanna-become-artists, Art, Inc.: The Essential Guide for Building Your Career as an Artist, it’s a inspiring read. …articulates a vocabulary of visual elements from which you build images, abstract or otherwise. As you examine line, shape, pattern, texture, depth, and color in detail, you become more aware of the elements that make up a painting, and better able to observe your own work without judgment and self-criticism. Oh oh oh, also have to share the fact that she has now published a paper book for collage artist’s called Collage Papers (over seventy full-size decorative papers!) – I bet I’d enjoy playing with those, and you too right? This book looks at our doodles as resources; treasures from which we can create full-sized paintings. Collage has enjoyed a resurgence in popularity during the twenty-first century, resulting in an explosion of creativity. This showcase of cutting-edge contemporary art from across the globe features galleries of collage by 30 practitioners, from the surreal landscapes of Beth Hoeckel to Fabien Souche’s humorous appropriations of pop culture. This collection is visual inspiration for art lovers and an appreciation of the transformation of old into new. “Color is powerful – it can change our moods or raise our spirits. It can be positively life-enhancing, yet so many of us struggle with choosing the right shades for our home, instead falling back on a safe but unadventurous palette of bland neutrals. Color can soothe, enchant or excite. And as Hans demonstrates, it has the ability to render rooms cool and calming, dynamic and stimulating or moody and intriguing. “The unforgettable, unknown history of colors and the vivid stories behind them in a beautiful multi-colored volume. The Secret Lives of Color tells the unusual stories of seventy-five fascinating shades, dyes and hues. From blonde to ginger, the brown that changed the way battles were fought to the white that protected against the plague, Picasso’s blue period to the charcoal on the cave walls at Lascaux, acid yellow to kelly green, and from scarlet women to imperial purple, these surprising stories run like a bright thread throughout history. In this book, Kassia St. Clair has turned her lifelong obsession with colors and where they come from (whether Van Gogh’s chrome yellow sunflowers or punk’s fluorescent pink) into a unique study of human civilization. Across fashion and politics, art and war, the secret lives of color tell the vivid story of our culture. Since I started reading the newsletter of Crystal Moody who has an online book club (and whose book I can not wait to get my hands on although it’s not finished yet, heh), I’ve added even more books to my wish list. They’re mostly not available here in Sweden, and ordering online is so expensive, so I dream of owning them aaalll (and having enough time to read them before the year ends) . I guess that’s one reason I make wish lists instead of buying I guess. Anyways. If you’re tired of being a chronic starter and want to become a consistent finisher, you have two options: You can continue to beat yourself up and try harder, since this time that will work. Or you can give yourself the gift of done. Beyond simply creating art I’ve got many other interest, one that is growing is my interest in house plants. That’s why I have added the German book (now also available in English – yay!) Urban Jungle: Living and Styling with Plants, to my wish list on Amazon. Over and over again I come across their crazy popular photos on Instagram of peoples “home jungles” – windows, shelves and entire homes fill with green plants. It always looks so warm and cozy that I double click and feel inspired. I’ve even got a Pinterest board called Greenery and plants – go check it out, and if you’ve got (or have seen) this book on urban jungles let me know in the comments, if it’s as awesome as their instagram account? Not on my wish list, but it maybe it should be on yours, is this one, from popular blogger SouleMama who takes beautiful everyday photos of her home-making and family and shares them on her blog. If you’ve got kids, this might be for your: Timeless advice on the importance of imaginative and creative play updated for a new generation of parents. Embrace family life with creativity at its heart. The Creative Family Manifesto is a guide to using the simple tools around you—your imagination, basic art supplies, household objects, and natural materials—to relax, play, and grow together as a family. When you learn to awaken your family’s creativity, wonderful things will happen: you’ll make meaningful connections with your children, your children’s imaginations will flourish, and you’ll learn to express love and gratitude for each other. This book is just what you need to get started. It carries on Amanda Soule’s thoughtful perspectives on parenting. My love for watercolors never dries up... This is a book on that subject, called Paint Yourself Calm: Colourful, Creative Mindfulness Through Watercolour, by Jean Haines, from last year. Doesn’t it sound blissful? “Meditative, peaceful and calming, watercolour painting offers a sense of control and self-worth to everyone, with no judgement or goal beyond the joy of painting itself. This book shows you how to calm and enhance your outlook through the movement of brush on paper. Master artist Jean Haines leads you on a journey through paint, showing you how to wipe away your worries with the soothing, gentle strokes of watercolour paint. “In Release Your Creativity, Rebecca teaches everyone how to create meaningful works of art with 15 step-by-step painting and mixed-media projects designed to get their creative juices flowing—no previous art experience required. These hands-on projects, coupled with inspiration and encouragement, help beginners explore and develop their individuality. The goal is to foster each artist’s singular point of view, so that each finished project is a unique expression of the person who made it. With her warm approach and nurturing sensibility, Rebecca Schweiger will show you the thrill of putting paint on canvas and the freedom of releasing your distinctive vision. If you need a journal spark in your life, I suggest you check this book out, called Journal Sparks. Using words, drawing, collage, and observation-based list-making, award-winning author Emily K. Neuburger highlights the many paths into journaling. Her 60 interactive writing prompts and art how-tos help you to expand your imagination and stimulate your creativity. Every spread invites a new approach to filling a page, from making a visual map of a day-in-my-life to turning random splotches into quirky characters for a playful story. ​It’s the perfect companion to all those blank books and an ideal launchpad to explore creative self-expression and develop an imaginative voice — for anyone ages 10 to 100! Phew, glad Santa won’t be able to bring me all of these, it would totally give him lumbago… And me angst because I could never pick which one to start with! I’ll just have to treat myself to one or two when I can, and let Santa drink his eggnog. Suggestions welcome on which one I should pick! Also, I wrote a wish list for artists a while back, and very humbly named it the Ultimate Gift Guide for Artists and just a few months ago I started the book series with another great book wish list, in case you want to check it out it’s a Creativity Book Wish List. Let me know below if any of these sparked an interest and if you check them out, let me know if they’re worth investing in. This entry was posted in A Creative Life, Book Reviews, I write Lists and tagged books, exploring colour, wish list. Bookmark the permalink. I added Finish: Give yourself the gift of done and Release Your Creativity to my own wish list. Relasease Your Creativity was available at the library so I just ordered. Looking forward to painting with it over Christmas break. Thanks for this awesome list! Haha, yes I know, lists like this expands your Wish List, right? Sorry but books are at least good for the soul!